Fujifilm has introduced a new duo of compact cameras to sit in its waterproof line-up. 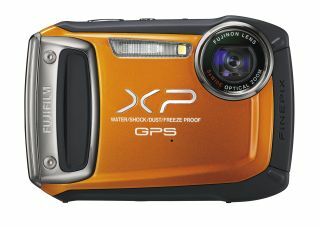 First up, the XP50 features a 14.5 million pixel CMOS sensor and is waterproof, shockproof, freezeproof and dustproof. Waterproof down to 5m, it can withstand shocks from a height of 1.5m with the ability to withstand temperatures down to -10 degrees celcius. The camera also features a new image processor and has ISO sensitivity up to 3200. CMOS Shift Image Stabilisation helps to keep shots crisp and sharply focused when capturing images in low-light environments. A 5x wide-angle Fujinon optical lens (28-140mm equivalent in 35mm terms) is on hand with 9cm minimum focus distance. The lens also has a special water repellent coating to help minimise water droplets from spoiling images. Full 1080p HD video recording is available at 30fps, while the new processor helps to minimise distortion. Motion Panorama 360 mode automatically stitches together individual images captured in a sweep across a scene. The back of the camera features a 2.7 inch LCD screen with anti-reflection coating. The Fujifilm Finepix XP50 UK price and availability has yet to be confirmed, but we do know it is available in black, blue, green, orange and silver. Second is the Finepix XP150, which Fuji is calling the toughest Finepix yet. It too is waterproof, shockproof, dustproof and freezeproof. Able to withstand water down to depths of 10 metres, it can also survive a drop from up to 2m, can keep functioning all the way down to -10 degrees, while dust and sand are kept out by extensive weather seals. A new high sensitivity GPS antenna has been added, making it easy to pinpoint location. The camera can also track movements and display the route on the LCD. A pictorial map of the locations visited can also be shown. Furthermore, the GPS also allows for an electronic compass and Photo Navigation functions. The XP150 also includes a 14 million pixel CMOS sensor and 5x optical zoom lens. CMOS sensor shift image stabilisation again helps to reduce camera shake, while ISO sensitivity reaches up to 3200. Full 1080p HD video capture at 30fps is available. Five colours will be available for the camera, but the Finepix XP150 UK price and availability is not yet known.